The great thing about your kids having kids is that it gives you a reason to act like a kid. I’m crafting like I’m 6. I now buy construction paper, pipe cleaners and glue sticks like they are staples. So long, eggs, milk and butter. Before Christmas we were saving empty toilet paper rolls to make Nativity figures. It was either that or the holy family on tongue depressors. Tough call. The intentions were noble, and the final products were cute, but it still seemed wrong. So wrong. After that it was marshmallow snowmen. 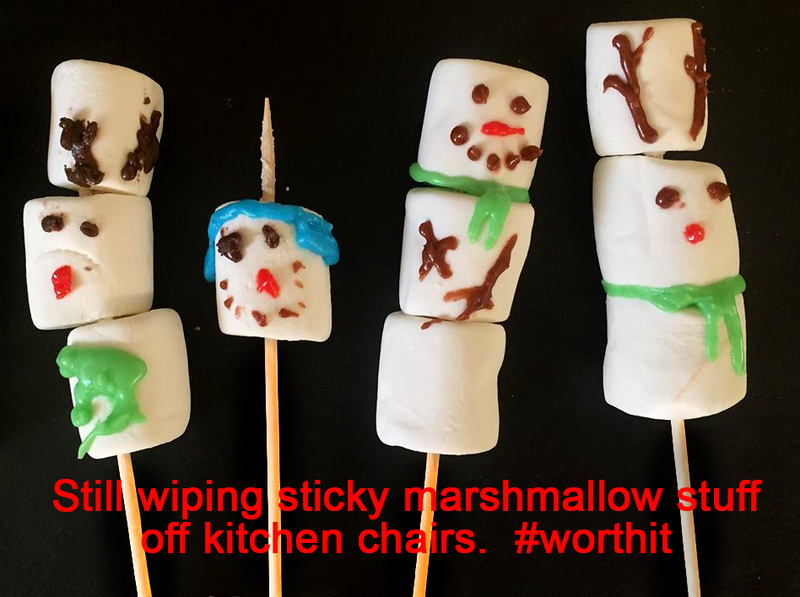 You thread large marshmallows on a wooden skewer, then use frosting to add eyes, a nose, a mouth, buttons and a scarf. Some of them were charming, but some of them looked like they had staggered out of a Snowman Zombie Apocalypse. Where’s global warming when you need it? We submerged some of the snowmen in hot chocolate simply to see them disappear. On the upside, the bad dreams only lasted a week. 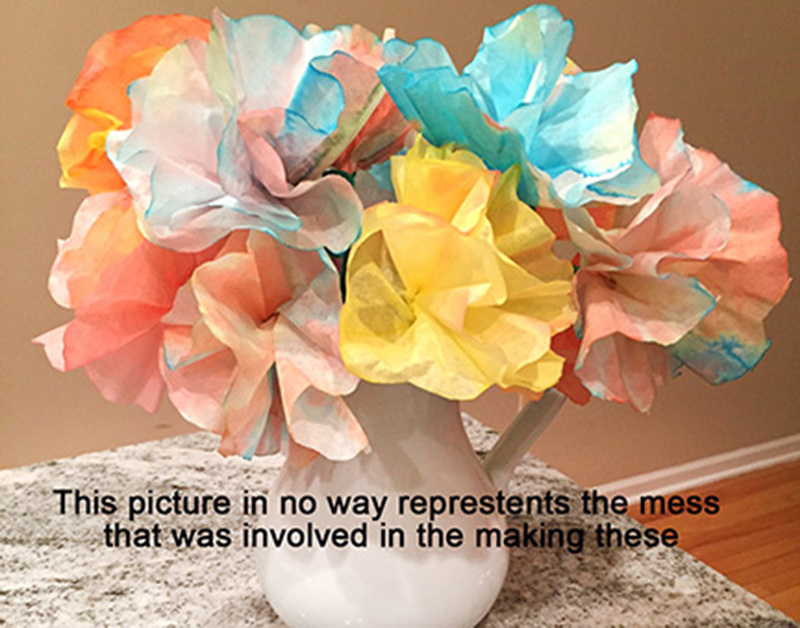 From there we moved on to coffee filter flowers. 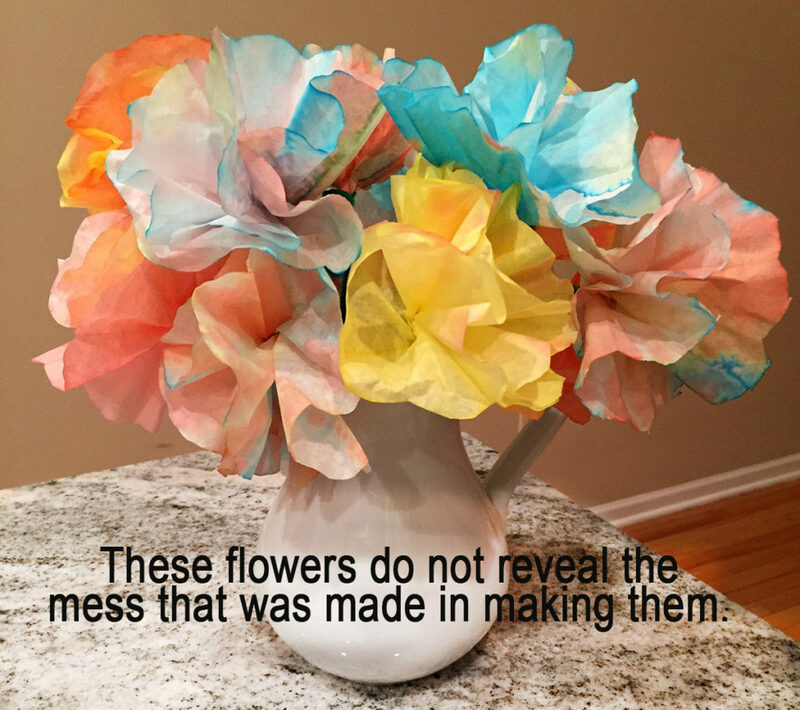 Quick, easy and pretty, although Grandma is apparently the only one able to securely twist the pipe cleaner stems around the base of the folded coffee filters. It’s good to feel needed. We are currently in the midst of a blizzard, or rather a snowflake craze. Snowflakes are for high-end crafters, which I am not. I remember making them in grade school and feeling inferior because the other kids turned out beautiful, intricate snowflakes while mine looked like moths splattered on a windshield. 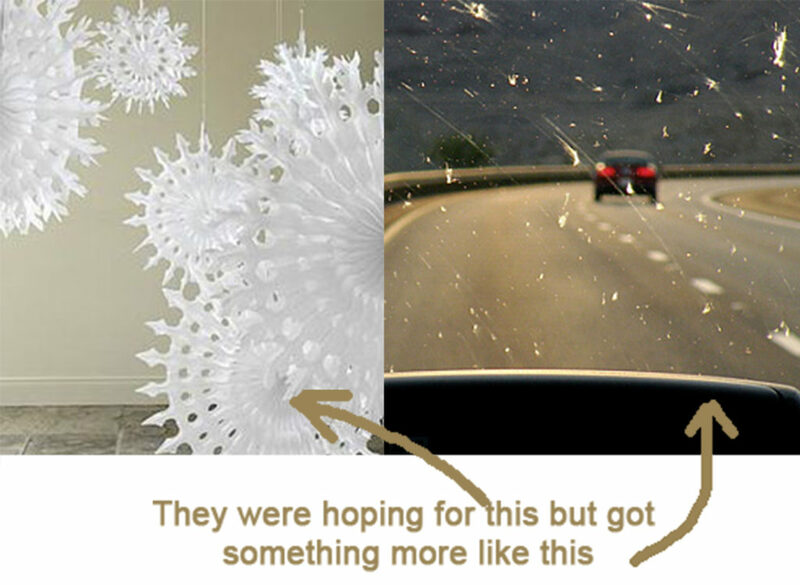 They hover near the computer, their hot little breath on my neck, as a Pinterest search pulls up directions for making snowflakes. The sample snowflakes are breathtakingly beautiful. Clearly, they have been created by engineers. With Ph.D.’s. “Let’s make that one! And that one! And that one!” they howl. I fold paper, make a few cuts and unfold it. True. But it’s a good Star of David. I try again. They are beginning to lose interest, some playing on the piano, one dancing, another asking if it is time for a snack. I spend the next hour helping fold paper and make tiny cuts with dull safety scissors. It would be more time-efficient to rip the snowflake patterns out with our teeth. Still, they are pleased with their creations and want to put their work on display. We’re the house in the middle of the block with white moths plastered to the windows.